I visited my old high school in the Lee-Miles neighborhood of Cleveland, Ohio, not long ago. It was hard to believe that it has been forty-three years since I walked its halls. For the most part, John F. Kennedy High School, a fortress-like brown-brick building devoid of any architectural flair, looks very much as it did the day it opened in 1965. Likewise, its students, who go by the collective moniker “Fighting Eagles,” outwardly mirror my former classmates. Back then, the school was 99 percent black. It was heavily black when it opened in 1965; it remains that way today. (With our Afros, dashikis, bell-bottoms, and platform shoes, the Class of ’71 exhibited a bit more style than today’s students. But to be fair, it’s tough for this generation of Eagles to stand out sartorially: they are saddled with the school district’s mandatory uniform—white or blue polo shirt; dark or tan cotton pants or skirt.) Two things, however, have dramatically changed since 1971: Kennedy’s economic mix and its academic profile. Four decades ago, Eagles were the sons and daughters of doctors, lawyers, small-business owners, and white-collar professionals, factory workers, civil servants, and skilled craftsmen. In short, we were solidly middle class. But that’s no longer the case. Kennedy today is an extremely high-poverty school. According to the district, 100 percent of the school’s 823 students were “economically disadvantaged” in 2013. This drop in income, which reflects the neighborhood’s overall economic retreat, has been accompanied by a decline in academic outcomes. Kennedy’s most recent state report card? Fs across the board. That means that at least 75 percent of students can’t pass the state test at the minimum level in any area: mathematics, reading, science, social studies, and writing. Equally dismal was the school’s four-year graduation rate of 50.2 percent—though that was a significant improvement over the rate in 2010, 38.9 percent. In the late 1960s and early ’70s, Kennedy was one of Ohio’s best high schools. 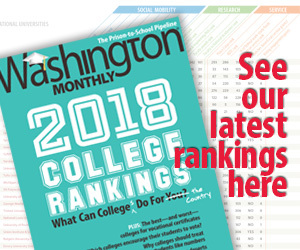 Its graduation rates were in the upper 90th percentile; each year it counted among its ranks several National Merit Scholarship finalists; and it sent more than 51 percent of its graduates to four-year colleges, including Ivy League schools. I spoke recently to several of my former teachers. They remembered a school community—administrators, teachers, and students—that strove to live up to the high bar set by Kennedy’s first principal, George E. Mills, the second black to be named a head of a Cleveland high school. In the school’s first decade, the Eagles won several statewide competitions in science, math, and music—along with a state track championship and two city football titles. The seeds of our success in and out of the classroom started with our parents. One of my fellow Eagles, Dr. Ronald Ferguson (Class of ’68), is a renowned education expert at Harvard. He calls the parents of our era “assertive and aspirational” trailblazers. In the early 1960s, our dads and moms refused to accept the status quo; tenacious in fighting for the best opportunities for their children, they moved from other areas to the nearly all-white Lee-Miles neighborhood. In short order, the racial demographics of Lee-Miles shifted, and by 1965, when Kennedy opened, the neighborhood was predominantly black, although the economic mix remained solidly middle class. During this period our parents, who embraced education as a top priority, took part in protests and demonstrations to end Cleveland’s de facto school segregation, which had produced overcrowded black schools and other discriminatory policies. School officials decided to address the issue of overcrowding, while sidestepping the volatile issue of integration, by embarking on a building spree in Cleveland’s black neighborhoods. The $3.5 million Kennedy, with the latest in science laboratory equipment and cutting-edge classroom design, was the fruit of that policy. Ferguson, whose research focuses on closing the academic achievement gap, notes that because Kennedy was state of the art, and because it was a low-poverty school, it attracted the district’s top teachers and administrators. That combination of dedicated teachers, top-flight resources, parental engagement, and an overwhelmingly middle-class student body was a recipe for success. The next major demographic shift was much more gradual; the black families in that first wave moved to the more-affluent Cleveland suburbs. Just like the rest of the city, Lee-Miles became poorer. By 2013, based on Ohio Education Department calculations, 95 percent of Cleveland students were low income. Recent figures indicate that roughly 21 percent of the Lee-Miles population is below the poverty line; single mothers head 30 percent of the households. The majority of Lee-Miles’s school-age children live in these poor households. That is not to say that Kennedy’s students and teachers today aren’t committed, but the obstacles they face are much more daunting. Cleveland, like so many struggling urban school districts, has been on a constant search for answers, willing to embrace almost any reform in a desperate bid to turn around its failing schools. This fall the district, armed with a $3 million private foundation grant, will divide Kennedy into three schools under one roof. Each school, with its own area of concentration, will be run separately and be rated separately by the state. I wish the new Kennedy well. But unless they find a way to change the school’s economic mix—by putting poor kids in classrooms with more-affluent students—I am afraid this latest reform experiment will also fail to meet expectations. There is no need to keep reinventing the wheel when we already know what works: economic and academic integration. Carl Chancellor is editorial director at the Center for American Progress. For more than twenty years he was a reporter and columnist for the Knight-Ridder news service and its flagship paper the Akron Beacon Journal, where he won a Pulitzer Prize.